The Persian historian Minhaj-i-Siraj, in his chronicle the Tabaqat-I-Nasiri, reported that thousands of monks were burned alive and thousands beheaded as Khilji tried his best to uproot Buddhism. The burning of the library continued for several months and smoke from the burning manuscripts hung for days like a dark pall over the low hills. If recent attempts to revive the university are to succeed in spirit and not just in name, the newly recreated Nalanda University must maintain continuity with some of the values and practices of the original university, albeit with modification to suit the times. This author in his book, Management and Creation of a Technical university, presently widely available at major international outlets as a revised edition – How to create excellent universities  – described this university and the need to revive it. The early Buddhists universities of India have long disappeared with decline of South Asian nations into third world status. The present day universities came to India with coming of Europeans who had preserved and developed the concept of a university as a center of higher learning. However, due to the general ethos as prevails in a developing country the newly established universities could not come up to international standards. None rate in the top hundred universities of the world and there is fear that the newly created Nalanda University may meet a similar fate. That would be unfortunate. Utmost attention is required by International educators and leading International Buddhist organizations to ensure that this does not happen. Indeed some such thing has already begun to happen. There is neither a single Buddhist scholar nor one of ethics and humanism on the board. Nor is there any from the fine arts. There is an urgent need to rectify the situation speedily because defects at the foundation stage of a university have a way of lingering on in to its future. When Hieun Tsang entered the university, there were 10,000 residential students. They came from all parts of India and foreign lands. It was India’s leading University. Its chancellorship was reserved for India’s foremost Buddhist scholar. At the time of Hieun Tsang, Silabhadra Maha Thera held the post. At that time there were about 1500 teachers, and about 1,500 workers at Nalanda. There were local students as well as foreign ones from Tibet, China, Japan, Korea, Sumatra, Java, Sri Lanka, Turkey and Greece. Admission to Nalanda was by oral examination. Chinese monks coming to India for higher studies in Buddhism had to go to Java and brush up their Sanskrit first. Hieun Tsang reports that only about a quarter of Indian and foreign students approved to seek admission through a preliminary selection, managed to pass the entrance examination. Therefore, the standard required was high. Caste, creed and nationality were no barriers to admission in keeping with the Buddhist secular spirit. All students remained in residence and there were no external students at the university. Aside from Buddhist studies, one could study secular subjects like science, medicine, astrology, fine arts, literature etc. The discipline, an essential ingredient of quality education, was exemplary at the university. The core academic area of Nalanda University occupied 30 acres as indeed is a requirement even of modern universities aiming at excellence, as discussed in the author’s book – How to create excellent Universities but the extended campus was much larger and encompassed neighboring villages, as it needs to be to house peripheral and residential facilities required by any good university. The heart of a good university is a library. There were three large libraries at Nalanda University. One of these was a high-rise building of nine levels even in these ancient times. 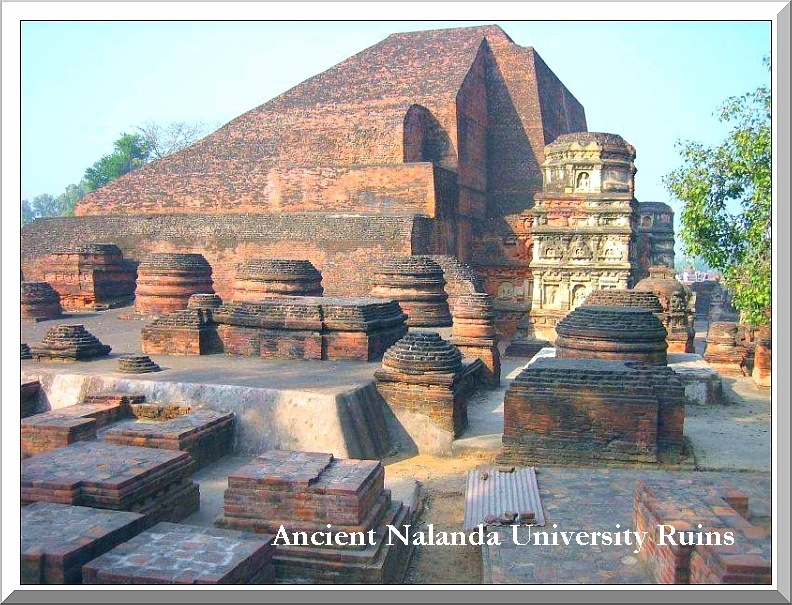 The revival of Nalanda University has recently been questioned by Buddhist groups from South and North East Asia. There are no Buddhist scholars on the board of the university and there is much fear that this university would be disrespectful of much that is fine in human heritage rather than a center of excellence. If Nalanda University is to claim back its glory, it needs to be substantially ahead of its time, just like its predecessor, in vision, ethics and moral standards. It need not remain an exclusive center of Buddhist learning and it may introduce many modern subjects, as indeed the Nalanda university of lore also did but it must be remembered that excellence in fundamental human values are at the heart of excellence. It needs to become a center of global ethical studies and standards as it was from its very origin. It seems that this essential requirement has been over looked. In the proposed schools at the revived university there is not a single one of ethics and humanism that comprised the core values of Nalanda University for over a thousand years. To disregard the past heritage of the university would imply that the new university is related to the old one in name only. In fact it is necessary to incorporate the ruins of the ancient university located some ten kilometers away as a part of the university campus albeit a disconnected one through appropriate intervention with the Government of India. It would also be appropriate to hold an initial initiation ceremony for all students at the old location. The original complex was built with red bricks and its ruins occupy an area of 14 hectares. (488 by 244 metres). This complex once incorporated in the university, as it must sooner or later can be developed as an extension center of a school of Archeology and History and can be extended to incorporate an auditorium to function as an initiation hall and perhaps also a convocation center. A rapid monorail transit system to connect the old and new campuses needs to be considered. This would require the intervention of the present Chief Minister of Bihar, Shri Nitish Kumar, who has deep roots in the area and who is regarded as one of the most progressive Chief Minister of India, where this university is located. 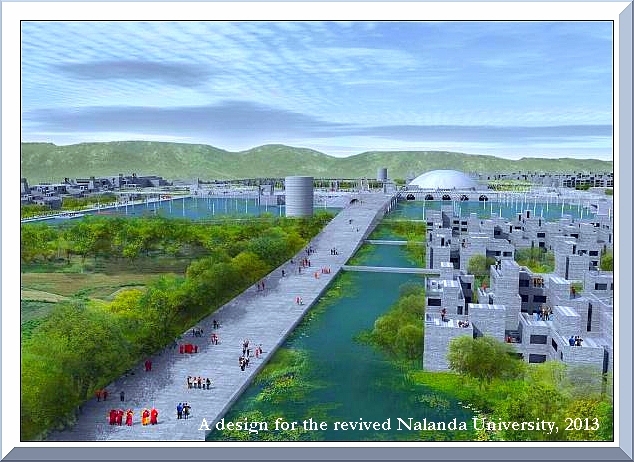 The revived Nalanda University, in order to function as an International University, would be constructed on a 455-acre campus to initially accommodate 2,500 students and 500 teachers. Fortunately the design of the new university has been chosen through an International competition. Of the eight proposals submitted by preselected architectural firms, this summer the jury selected  the design drawn by Vastushilpa Consultants, a well known architectural firm based from Ahmedabad in India for its clarity of thought and ability to take forward the vision of Nalanda. However, in order to come up anywhere to the standards of the original university there will be a need in the not to distant future to expand residential facilities to at least twice as many students and teachers along with an equal number of workers. It is unclear if the architects have kept this factor in mind. The current Governing Board is actually an interim one. It was mandated to function till a regular Governing Board was constituted as per Section 7 of the Nalanda University Act, 2010 or one year until November 2011 which ever is earlier but those, who comprised this interim Governing Board, earlier called Nalanda Mentor Group now function as the Board. All though many of the members are distinguished educators of the modern world, none have even suggested that the new university needs a school of ethics and humanism or even one of fine arts for which the university was well known at one time and which marks the significance of beauty and higher human values. Rather it is schools such as business studies that have been proposed. It must be remembered that Nalanda University was not conceived as a competitor of Harvard or the Wharton School but rather as a leading light not just of higher education but higher human values as well. One of the most highly regarded personalities of Buddhism, the Dalai Lama resides in India and it would have been far more appropriate if he had been requested to become the Chancellor instead or a visitor of eminence. The Indian Ministry of External Affairs, the administrative ministry of the Nalanda University, appears not to have made any effort to constitute a regular Governing Board yet. Rather Section 41 of the Nalanda University Act, 2010 was invoked twice – in 2011 and 2012 – to prolong the lifespan of the interim Governing Board. Now that its third term is coming to an end in November, 2013. There is an attempt to amend the Nalanda University Act, 2010. The act does need revision but it should be revised in a manner so as to remove its shortcomings in the initially hastily put together proposal and not perpetuate them. A priority needs to be given to evolved human values rather than prevailing bureaucratic ones. Without a department of ethics at the new university its very purpose would be defeated. Not only is such a school necessary but courses in ethics and human values must be compulsory for all students of Nalanda University so that they may emerge as citizens who can alleviate the present distress in the modern world, even advanced parts of it, rather than perpetuate more of the same. Although Buddhist institutions were destroyed in India over the past millennium, outside India, its excellent traditions have been maintained in other countries such as Japan where several excellent Buddhist Universities exist . It is essential that senior faculty of the best from amongst them should be requested to serve as members of the Board of Governors as well as visiting faculty and to that end a school of Japanese Buddhist studies is essential at the new university. Japanese scholars have expressed interest. 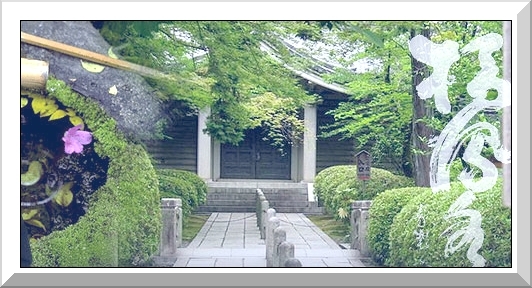 In a talk by Susumu Nakanishi, the Director of the Nara Prefecture Complex of Manyo Culture, originally broadcast on NHK TV on December 14th, 2007 in his program “Shiten Ronten” such a desire was expressed and he focused strongly on the ethical possibilities. It is not clear why their involvement is not being sought. Without a Japanese involvement the university is unlikely to ever reach its full potential. At this moment, it is reported that the current setup has attracted an international commitment of about US$ 100 million, which is far from its targeted sum of US$ 1 billion. The ability to revive the university’s famous name and a lack of deep appreciation of human and ethical values, the very basis of excellence of Nalanda University in the past, is perhaps to blame for this lack of support. With corrective steps and involvement of reputed International scholars as well as not just Buddhist organizations but even scholarly Christian ones from the oldest highly reputed universities of Europe, it can still become an unparalleled institution  in higher education and a leading light of human civilization in the current Millennium as it has been in earlier ones. Higher Technical Education is regarded in this note as university level education that leads to a bachelor’s degree or higher (Masters and doctoral degrees) in any branch of engineering or engineering related technology. In India this education is currently provided by universities (including institutions deemed to be universities) and colleges affiliated to universities. Over the past decade there has been a proliferation of privately run affiliated engineering colleges. Such colleges have now become the major means of delivering higher technical education in the country. As a result, the number of engineering graduates produced in the country has increased sharply. However the same cannot be said for the quality of education. For reasons that will be discussed in this note, there has been a rapid and drastic deterioration in the quality of higher technical education in recent years. There is an urgent need for improvement in order to maintain basic minimum standards of technical competence within the country. It is worth mentioning that the possibility of attaining excellence is much greater when higher education is offered directly by a university rather than a college affiliated to a university, provided the university is not a cover for a profit making business. The quality of an affiliated college is limited to the quality of the university that affiliates the college. In India the best universities such as the Indian Institutes of Technology or the National Institutes of Technology do not affiliate colleges. Rather the task of affiliation is relegated to other universities or even administrative set ups for managing a group of colleges and holding exams rather than universities in the true sense with their own dedicated faculty and academic programs, such as the U.P Technical University, set up by state governments. Further, since the affiliated college does not design its own curriculum but rather prepares students for an examination on a syllabus supplied by the university, it has little freedom and flexibility to adjust its programs to student interests and available competence of faculty. The examination system is so complex in the affiliated college system that the possibility of interdepartmental programs based on the credit system are nearly impossible to set up in an affiliated college. Without it, excellence in technical education is impossible in the present age of diverse technological needs by the industry. A more detailed comparison of the programs offered by universities to those offered by the affiliated colleges is not possible here. It is available in a book on the subject by the author. However in spite of this limitation the expansion of technical education in India is primarily taking place through privately run affiliated colleges. Beginning this year, the affiliated private engineering colleges, already lacking in essential infrastructure and faculty have been permitted by the regulating body (AICTE) to run additional degree programs in second shifts. This will further erode the quality of education. In fact the very concept of running education programs, as a second shift is abhorrent even at the high school and primary school level leave alone the university level, and that too for professional studies. Within the AICTE, India also has an accreditation board that grants accreditation to engineering programs. However, this accreditation is not mandatory. In the past, the accreditation board worked on the basis of qualitative guidelines such as “The faculty strength, cadres, qualification and level of competence and performance should be adequate to accomplish the institutional mission and goals.” No quantitative criterion such as the actual qualification of the faculty members etc. was specified. Colleges were graded on the basis of the qualitative judgment of the visiting experts. Such an assessment therefore depended on how pleased the experts were (or how much they could be pleased). Beginning this year 2009, some quantitative criterion have been added to the guidelines. Since no applications under the new guidelines have been received from any college yet at the time of writing this note, it remains to be seen, what the impact is on the quality of education and how these guidelines will be implemented in future. In this article the reasons for expansion of higher technical education are discussed followed by some of the major factors leading to a deterioration in education quality i.e. faculty, size of campus and Governance. The only item of infrastructure discussed in the present note is size of campus since other things such as classrooms, offices, workshops, hostels etc. can be built provided land is available for it. A college that does not have the required land has no possibility of developing such infrastructure even in future. An acute shortage of engineers in industry: If one checks the employment figures of fresh graduates over the past several decades in India, it will be very clear that the number of engineering graduates produced every year by the various universities and colleges has in general far exceeded the capacity of industry to absorb them in nearly all branches of engineering. Even in areas where the industry such as information technology expanded rapidly some years ago, the number of graduates exceeded the requirement of industry. It may also be argued that even if the need of the industry for trained manpower is acute, it serves little purpose if the universities supply improperly trained graduates. The Indian industry has constantly complained that graduating engineers are insufficiently educated. A demand for engineering education from the public: It is true that the public has held university education in high regards. Any parent who can afford such education aspires that their wards acquire a university degree. Amongst university degrees, a professional degree such as an engineering degree is the preferred one in a majority of cases. In the past the vast number of arts and science graduates were unable to obtain employment commensurate with their qualifications. It is not unusual to find university graduates working as peons or sales persons in the offices and shops across the country. A mere high school degree would have been sufficient for the purpose. The same scenario is now inevitable with engineering graduates as well. About a decade ago, it was relatively more difficult to get admission to a basic science degree program as compared to engineering one. The situation now appears to have reversed. Students with below average high school grades can now get admission to an engineering degree program provided they are able to pay the high fees required by a private college. All that is required is to appear in an engineering entrance exam held by a state or C.B.S. E. Appearing in this exam is merely a formality since it has happened often that the number of available engineering seats is larger than the number of students seeking such seats. The possibility of making a profit by providing higher technical education: Although the concept of making a profit from regulated free enterprise is an acceptable practice in most democratic countries of the world, it is debatable if this concept should be extended to higher education. The reason is that as compared to a product such as soaps and cosmetics that may influence the health or appearance of an individual temporarily, education molds character and thus influences the character of a nation. Further the greed for profits by private industry is perpetually in confrontation with regulators appointed to maintain public interest and social responsibility. If for any reason, the desire for profit is improperly regulated then public and national interest suffers. This can happen if any specific industry manages to hoodwink the regulators or if regulators develop vested interests by sharing the profits. In the latter case, the public suffers over the short run and the nation as a whole over the long run. As mentioned, if the product being regulated is soap or cosmetic the harm may be temporary or superficial. If the industry is the education providing industry, the harm is likely to be far more serious and long lasting. It is probably in recognition of this fact that current regulations prescribe that technical colleges offering degree programs can be founded by non-profit organizations only. However, if the founders devise ways of withdrawing profits discreetly from their enterprise, then the stipulated requirement of a non-profit motive remains one on paper. It goes without saying that if engineering courses have to be taught, there has to be faculty to teach those courses. Both AICTE and the affiliating universities are supposed to ensure that faculty strength is adequate before approving new courses in colleges. The faculty strength is adequate or shown to be adequate at the time recognition is sought and granted. Soon enough though it falls to woefully inadequate numbers. The status at the present time is that the faculty strength is drastically short in most educational institutions offering engineering courses. The institutions complain that faculty is not available. There may also be other reasons for shortage of faculty strength in private colleges. There is a simple way to encourage private colleges to recruit sufficient numbers of faculty members and to retain them. The method is to index the permitted annual student intake to faculty strength. For example, the addition of a simple a simple new rule that any department of an engineering college can admit a maximum of 4 multiplied by permanent faculty members in a department (faculty members that have been on the rolls of the college continuously for at least one year prior to admission date) then much of the problem will be solved. Thus a department with seven faculty members would be able to admit only 7×4 = 28 new students, whereas another with a faculty strength of fifteen members can admit sixty new students in first year in that particular department. There is a need to put a cap on the maximum number of students that can be admitted into a department. A maximum strength of 90 students is the desirable number here. 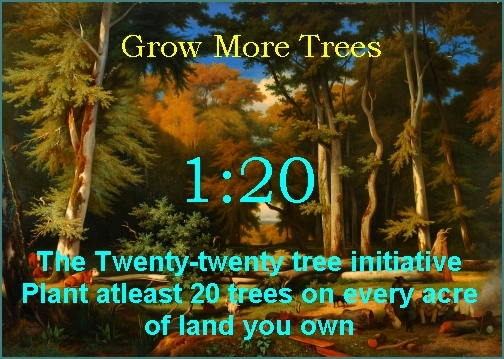 There should be a cap on the minimum number too, and this may be placed around 28. Thus departments that have woefully inadequate faculty strengths will not be able to admit new students in a year when faculty strength is insufficient. It is essential that in counting the faculty strength for the present purpose that the faculty has been on the roles of a college for at least one year. This is because some private colleges can build up enormous faculty strength temporarily for brief periods. Incase a college cannot find and appoint new faculty there is no reason why it should be allowed to admit new students. A problem that is even more serious than the strength of faculty members in a department is the minimum qualifications that AICTE has prescribed for recruiting faculty members. At the present time it is even less than the qualification required for recruiting a teacher in rural primary schools for young children in backward districts of India. In a primary or secondary school a mere bachelors degree is insufficient to become a schoolteacher. An additional qualification of a B.Ed. Degree is required. Good schools require teachers to have a master’s degree as well. On the other hand AICTE has prescribed that a mere bachelors degree (with no additional required experience) is sufficient to become a faculty member of an engineering college. As a matter of fact the majority of faculty members in private engineering colleges of India are persons with a mere bachelors degree, some recruited from amongst the graduating students of the same college. Most colleges around the world as well as a few of the top colleges of India such as IITs require a minimum of a doctoral degree for a person to be considered to a faculty appointment. This situation needs to be rectified immediately in all engineering colleges in India. There is a need to prescribe a minimum qualification of at least a Masters degree (M. Tech. Or M. E.) for recruitment to a faculty position. The degree must be from the same branch of engineering as the department the faculty member joins. If persons with a mere bachelors degree are employed in a department, they must not be designated as faculty members but be counted as associated staff. Their designations can be teaching assistants, instructors or technical assistants. Further such staff should not be counted when calculating the number of students that can be admitted to degree programs as suggested in the earlier section. With the introduction of this new rule a question may arise as to what should be done with existing faculty with bachelors degree. Perhaps as an interim measure, the more experienced among them e.g. those with five years or more of teaching experience may be allowed to continue in their existing designation as a one time measure only. Others may be granted a three-year lien at the end of the prevailing academic year to acquire a masters degree and then return to teaching if they wish to. Another alternative is to provide the existing staff with new designations. In general engineering education requires a larger campus size than a college of basic sciences and the arts. This is because of the need for workshops, engineering laboratories and utilities to run the laboratories etc. If the campus is a residential one, then the campus has to be large enough to accommodate hostels, play fields as well as accommodation for at least some of the faculty and staff. The best engineering institutions in the country i.e. the Indian Institutes of Technology are fully residential. Current regulations formalized by AICTE require that engineering colleges have hostel accommodation for 25 percent of boy students and fifty percent of girl students on campus. This is adequate provided the college is located within the municipal boundaries of a town or city. However because land is more easily available outside city boundaries and in rural areas many new colleges have come up outside cities. There is a need to require such colleges to provide accommodation for 100 percent of Students and a substantial portion of the faculty and staff as well. In the absence of such a requirement a considerable portion of the students time is wasted in commuting. This is loss of valuable study hours during a supposedly intensive program of training for an engineering degree. Since private colleges earn their income primarily from tuition fees, they continuously wish to increase enrollment by increasing admission in existing programs and by launching new ones. Thus, there are campuses for running engineering colleges that simultaneously run colleges of pharmacy, fashion academy, management colleges etc. A peculiar fact is that it is AICTE that approves colleges of Pharmacy in India. This is beyond the stated mandate of Technical Council. The medical council or a similar body should review such colleges. The subsequent crowding on campus can only lead to a severe deterioration of educational quality in the best case and severe indiscipline on campus in the worst. Currently both are happening on most college campuses in India. Good education cannot be provided if an educational campus lacks serenity. The present scenario is such that colleges exist that are more crowded than market places. There is no segregation between the hostel area and academic buildings and land is lacking even to put up essential facilities leave alone play fields for students. There is an urgent need to cap the total number of students registered for study in all of the programs running on a particular campus. An approximate thumb rule for this cap can be a total of 200 students per acre of a campus located within municipal boundaries of a city or town and 100 students per acre of a campus located outside such boundaries. Thus an urban campus of ten acres should have an upper limit of 2000 students only across all disciplines and shifts. If the only programs it runs are four-year engineering degree programs then this means enrollment must be restricted to five hundred new students per year or less. A campus located outside a city must then be at least twenty acres for equivalent student strength. On the other hand the National knowledge Commission Chaired by Shri Sam Pitroda has suggested the scrapping of the All India Council for Technical Education (AICTE) and instead creation of an Independent Regulatory Authority for Higher Education which would give sanctions for starting technical and business schools. The minister of state for planning M V Rajasekharan said in the Indian Parliament that the challenge, therefore, is to design a regulatory system that increases the number of good institutions and fosters accountability. However even if a new regulatory authority is set up it may fall into the same pattern unless clear-cut guidelines are given to it that will lead to improvements. A few have been discussed in this brief note. A National Board of Accreditation (NBA) has been constituted by the All India Council of Education (AICTE) to periodically conduct evaluation of programmers on the basis of guidelines, Norms and Standards specified by it and to make recommendations to it, AICTE or to the Council, or to the Commission or to the other bodies, regarding recognition or de-recognition of the institution or programmes. The aim is to ahieve excellence in higher education. Prior to the year 2008 the guidelines provided to NBA consisted of qualitative criterion. Assessment was therefore entirely a subjective matter left to the judgment of the assessing officers. Beginning October 2008 the AICTE has issued new revised guidelines that include some quantitative criterion and mathematical formulae. A careful evaluation of the original as well as revised criterion reveal that the real issues that are leading to a weakness in the quality of Higher Technical education in the Country have not been addressed even in the revised guidelines. For example a major weakness has been cramped educational campuses. No mention or weightage has been made for the size of campus in the new or old guidelines. A similar tendency to skirt around the real issues is noticed throughout the guidelines e.g. although the revised guidelines mention the size of classrooms no mention is made of the number of classrooms. A mention is made of the type of books in the library but none for the actual number of volumes. The new guidelines continue to recognize persons with a mere bachelors degree as faculty member, whereas they can be no more than teaching assistants at best. Mention has been made of budgets and use of financial resources but there is no mention of the power of Director/principal or other senior officials of the college and if they have any role in the preparation, management and execution of budgets.